I was really lazy last week and wanted to make dinner without going through too many extra steps. This recipe was born from my laziness (if you want to call it “laziness”, cuz I was *still* making dinner). 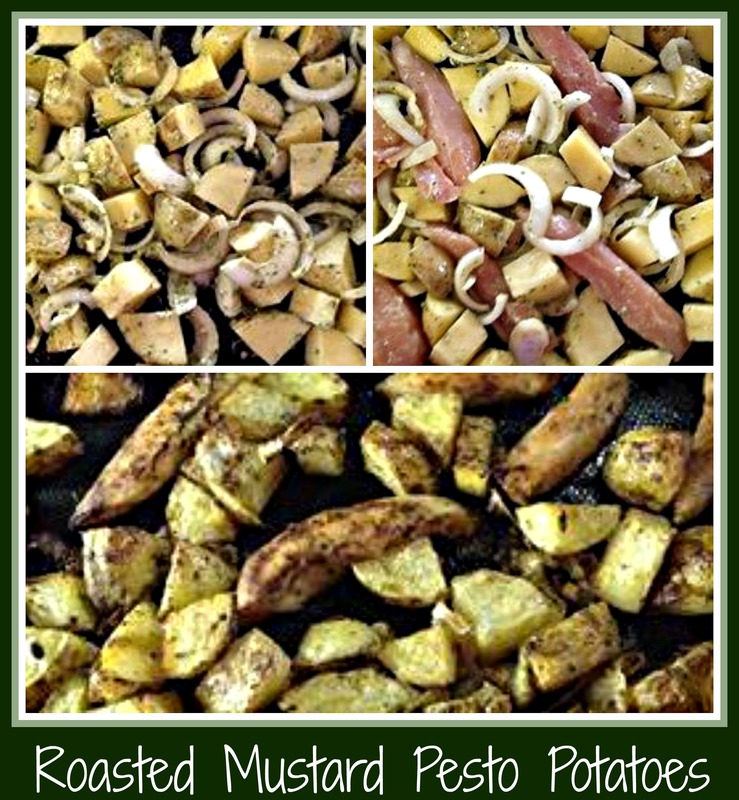 I started with the idea of roasting some Yukon Gold potatoes and this recipe emerged. Please remember that you can always use whatever ingredients you like when making one of my recipes… I am only attempting to give you ideas from which you can branch out and create your own family favorites. I started with four Yukon Gold potatoes and one onion. I cut the potatoes into same-size chunks and cut the onion in half before slicing it into half-moon shapes. I sprayed a baking sheet with cooking spray and then laid the potatoes and onions in a single layer on the sheet pan. Being lazy, I simply plopped the ingredients on top of the potatoes, but next time I will probably mix them in a bowl and pour the sauce over top. For the “sauce”, I used olive oil, dijon mustard, kale pesto, salt and pepper. I tossed the potatoes and onions with these ingredients and then “thumbed” some James River Cellars’ Chardonnay over the whole mixture. At this point, I realized that I had totally neglected to add any meat for our dinner… and that would never fly. Since I didn’t want to roast a package of chicken tenders separately, I just added the individual tenders into the potato/onion mixture and turned them in the “sauce” to pick up some flavor. This was my “easy out” way of making a two course dinner without any extra effort. I roasted the entire baking sheet at 375 degrees for about an hour – this really was too long, but I had started making dinner so early that I was getting hungry before we were planning to eat. Next time, I’ll adjust the oven temp and the cooking time so things don’t get quite so crispy but even so, dinner turned out really well. BONUS RECIPE: I found out that my husband isn’t as big a fan of roasted onions as my son, so I had quite a few left over to go with my extra potatoes for the next day’s lunch. Since I had leftovers, here’s a quick way to use them up in a simple lunch-for-one. I cut the remaining potatoes into smaller pieces, added the roasted onions and cut up two of the leftover chicken tenders, tossing all in one of my favorite salad dressings. This became a really easy and tasty lunch for me and I didn’t feel like I’d wasted food. Always a plus in my book! Have fun making this recipe your own. Use a different mustard… leave out the pesto… use a salad dressing or add balsamic vinegar with the oil… this is when you can let your creative juices flow to make something entirely your own. I wish you a delicious meal… as always! This entry was posted in Cooking, Recipe, Wine and tagged bonus recipe, chicken tenders, easy recipe, James River Cellars Chardonnay, kale pesto, mustard, onions, potatoes, salad dressing.